You know how some Mexican restaurants will serve a little dollop of this delicious sweet corn...stuff...on the side of your plate? I've always loved that stuff and wondered what it was, exactly. Well, it's sweet corn pudding. And it's delicious and not hard to make at all! I made a batch to go as a side with our second Thanksgiving dinner (the one I made at home so we'd have leftovers - because what is Thanksgiving without leftovers?) and it was a hit. My husband says it's the only way he enjoys eating corn. Guess I'll keep it to myself that this recipe is a little rich and should only be served in little dollops like at the Mexican restaurants, and not in giant, American-sized portions. Keeping that in mind, this recipe should make enough for 6 people. Masa harina is a flour made from corn. It is not the same thing as corn meal. You can find it in the baking or Hispanic section of your grocery store. Preheat oven to 350 degrees. In a medium bowl beat together the softened butter, masa harina, and water until well mixed. 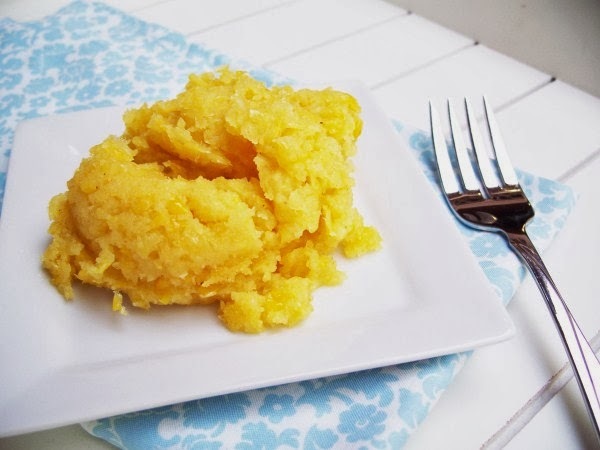 Using a food processor or blender, process the thawed corn, but leave it a little chunky. Stir into the butter mixture. Add cornmeal, sugar, cream, salt, and baking powder and stir to combine. Pour batter into an ungreased 8x8 baking pan. Smooth batter and cover pan with foil. Place pan into a 9x13 baking dish that is filled 1/3 of the way with water. Bake for 50-60 minutes. Allow to cool for 10 minutes before serving.